Does anyone have experience or thoughts on log splitters for skid steer loaders? I have used a 35 ton Huskee log splitter in the past. It met my needs but it can get very tiresome to wrestle the logs into place. I've never used a skid steer log splitter so my opinions are not from experience. However, after a lot of research and many hours of standing over a standard log splitter, I do have a couple of thoughts. I'm assuming you're referring to the inverted log splitter that hooks to the front of the skid steer allowing you to drive up to a log on the ground, position the wood splitter over the log and split it without needing to pick up the log like you would have to do with a traditional splitter. Before you make your purchase I would consider a few pros and cons for the device. -The inverted splitter allows you to split a log without lifting it on to the splitter saving energy and keeping you inside a warm cab if it's cold outside. - If you order firewood by the semi load you can use the splitter to pick the 8' logs off the ground and then quickly cut them with your chainsaw without worrying about touching your chainsaw blade to the ground (although you will have to get in and out of the skid steer multiple times). - You can pick up a log and split it over a truck or trailer, eliminating the need to handle the wood several times. - You'll save energy and possibly reduce the risk of injury since you're not handling the wood as much. Pinched fingers, hernia's and the possibility of smashing your hand with the wedge are significantly reduced. - Use of fuel. Running the skid steer will use a lot more fuel than the small engine attached to a standard hydraulic log splitter. Since most of us heat with firewood to save money, every little bit of savings helps. - With the splitter hooked up to your skid steer you limit a great machine to just one function. Skid steers or tractors are vey useful when cutting firewood. Dragging logs, grapples and buckets all make cutting firewood easier. With the splitter attached to the front I think it limits a great piece of equipment. - Since you'll have to move the skid steer a lot to position it over the wood you will quickly tear up the area making the ground really bumpy or creating a mud pit. Plus, you won't have the bucket attached to smooth it out. - The skid steer attachment will be slower than just picking up a piece of wood and placing it on the traditional splitter. Although many of the skid steer splitters have 4 way wedges, I think you'll waste a lot of time trying to position the wedge on the wood, or even worse, constantly driving over previously split wood to reach another log. - Smaller pieces will make the splitter less efficient. I can only imaging how frustrating it would be to mess with a bunch of small logs. - Added hours to your machine. If you resell your skid steer just about everyone will look to see how many hours are on the machine. Even though splitting wood is "light hours" most people just care about the number. In theory I think a log splitter that hooks to the font of a skid steer sounds great at first, but if you consider all the different factors it's hard to beat a standard log splitter. 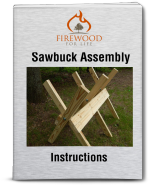 I'm always looking for a way to make cutting and processing firewood cheeper and easier, however I don't think this is worth the cost or the hassle of messing with the unit. These are just a few of my thoughts. I would love to hear any other opinions or experiences from our visitors!